I was going to do a 7th IVF and I was going to do it with SIRM. We were doing the estrogen priming (EEP) protocol with intralipids. (to try to over come my immune issues). They wanted me to do a saline ultrasound first though. So I went to get that done but the doctor (I had it done local) was having a very hard time getting the catheter through. Now usually this doesn't surprise me because my cervix can be tricky but it took them around 45 minutes and they will weren't sure if they had it through. Now I swear I saw it on the u/s screen so I know they got it through eventually. But the saline never entered my uterus and they flushed it numerous times. So Dr T with SIRM wanted me to have a hysteroscopy. SO I had one done and to make a long story short it showed that my uterus was filled with scar tissue. I was diagnosed with severeAsherman's Syndrome and was told I couldn't get pregnant. Actually the doctor told my husband and I was later told at my follow up appointment. I went home and did some research and found out that most of the time Asherman's comes from surgeries like D&C's. Mine must have come from the infecgtion I had: Chronic Endometritis. I'm still baffled though. I decided to do some digging so I went to my last RE and I got both my endometrial biopy results as well as my hysteroscopy results and picture. Comments: Endometrium is not identified in this specimen. Clinical correlation is recomended. Dense mucus containing few strips of endocervical epithelium and an eggegate of inflammatory cells. No endometrial tissue identified. Three levels are examined Gross Description: Specimen labelled "endometrial biopsy" received in formalin and consists of an aggregate of dense, mucoid material, measuring 0.7 ml. the specimen is submitted in toto. My main concerns is in both of the biopsies from what I read there was no endometrial tissue. my other concern is this. read clinical diagnosis and hystory for endometrial biopsy #1. this came from the lab it says adhesiions this is what adhesions are when I looked it up online: I'm fuming right now. Intrauterine Adhesions ( Asherman's Syndrome ) Menstrual disorders and infertility are the most common presenting symptoms in women with intrauterine adhesions ( also known as synechiae ); others include recurrent pregnancy loss and placenta accreta. Any insult severe enough to remove or destroy endometrium can cause adhesions, and the gravid uterus seems particularly susceptible to injury ( D & Cs for miscarriages, elective abortions, or postpartum curettage or caesarian sections). 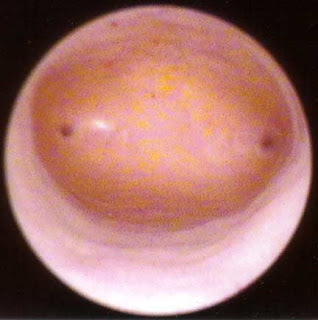 Less commonly, adhesions may develop as a postoperative complication of abdominal or hysteroscopic myomectomy, metroplasty or septoplasty procedures, or other uterine surgery. Chronic inflammatory or infectious insults, notably genital tuberculosis, also can result in intrauterine adhesions ( rare in the United States ). Hysteroscopy is the method of choice for treatment of intrauterine adhesions and is safer and more effective than blind curettage. He didn't think to mention this to me? 17 months later my uterus is filled with scar tissue and I"m told I will never concieve. This could have been caught had he told me I had adhesions/ashermans. It was the beginining stages from what I understand...I mean if my uterus was still pink/tan back in 2007. I mean who knows what "could" have happened but I wasted my time and emotions on 3 IVF's when I probably had no endometrial lining. Even though I had great "lining" on my ultrasounds my doctor that did my hystersocopy says "you don't know what that lining is". During the saline u/s I measured 8.5mm lining. That was right before my hysteroscopy. Clearly that was the scar tissue they were measuring. I called the lab and I asked them who wrote that line and they said "that is what the Dr. wrote but that is not the final diagnosis. that is what he suspected when he sent in the sample"
Here is the picture of my uterus from 2007. He said my uterus looked "normal" in his report. Yet he told me that my uterus was enflamed and I had an infection. 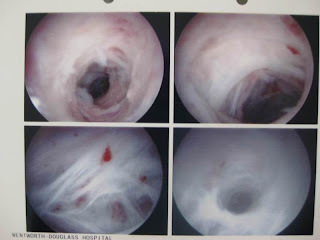 Here is the picture from my latest hysteroscopy. Top left is the inside of my cervix. Top right is the end of my cervix and entrace to my uterus. 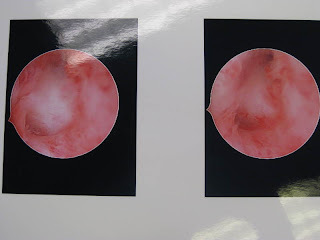 Bottom left is the inside of my uterus and the bottom right is my left tube after she cleared away all the scar tissue. Note how you can see both tubes very clear in this picture and how the lining is smooth and pink. not enflammed and rough like mine was in my first hysteroscopy. I'm convinced that I did have Asherman's back when I had my 1st hysteroscopy and that he should have caught it. I'm not going to play with the "what ifs" but I can't believe he let me do 3 IVF's with him (IVF 4, 5 & 6) knowing that my endo biopys results said "no endometrium found" which meant there was no endometrial lining in the sample, no where for the embryo's to implant. What ever he took was something else, like...say...scar tissue. Ok before I get my self all upset I think I'll end this post right now. Hubby and I go see a specialist for my Asherman's tomorrow. We'll see what he has to say. We are done trying to get pregnant. At least done with the IVF's and crap. We just want to make sure I stay healthy and that this doesn't turn into something like adenomyosis or any other form of endometriosis. I have more to update on but I will make seporate blog entries. Hopefully the specialist has some answers for you tomorrow.